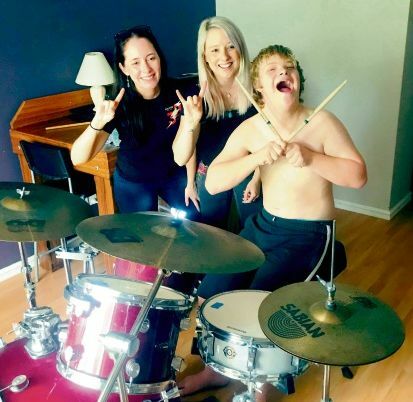 BERTRAM teen Rosco House (14) has been smashing out the beats on a drum kit recently donated by musician Kylie Soanes. Fellow Legs Electric band member Erin Gooden also presented Rosco with a $100 voucher for Mega Music ahead of World Down Syndrome Day on March 21. Mum Annie said Rosco, who has Down Syndrome, has loved music from the day he was born. “He phoned all his mates after the girls left to tell them about meeting the girls and about his drum kit,” she said. Rosco is part of a program called Music Rocks which teaches children with special needs how to play instruments. Soanes has played the drum kit with many bands internationally and used it while recording the Legs Electric Maximum Rock ‘n’ Roll EP. “Music makes everyone happy and every dream starts with an opportunity,” she said.